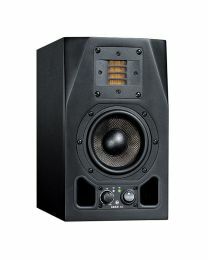 ADAM Audio monitors' great reputation for sonic excellence is no secret. Nor is their sheer, unrivalled quality. But their awesome X-ART tweeter takes things to a whole new level, thanks to an extended frequency range up to 50kHz plus vastly improved efficiency compared to dome tweeters. The design of this high frequency speaker is unique, and has fast become a highly desirable and sought after source of transparent, highly defined and wonderfully authentic sound. Painstaking hand-testing carried out by experts in their Berlin lab makes the ADAMís high frequency driver stand out above the usual mass produced, automatically-tested gear. No wonder ADAM Audio has such a large and loyal worldwide network of distributors and dealers, spanning more than 75 countries including the USA, China and Britain. It's no surprise that they simply fly off our shelves.